There is a whole category of snacks in Japan that are marketed as accompaniments to alcohol. Since this is a country where alcohol is an important social lubricant that allows stoic salary men to let loose on a regular basis, one can say that alcohol operates as a socially sanctioned therapist opening cathartic floodgates and letting the tension pour out. These types of snacks to accompany alcohol are called "otsumami" in Japanese. They range from little whole dehydrated fish to strips of squid to chips and pretzels. I've seen the scarier bits hanging in convenience stores and liquor shops for years, but am not brave enough to chow down on dried fish as they stare back at me with their dead eyes. Pretzels, on the other hand, can hardly be offensive. 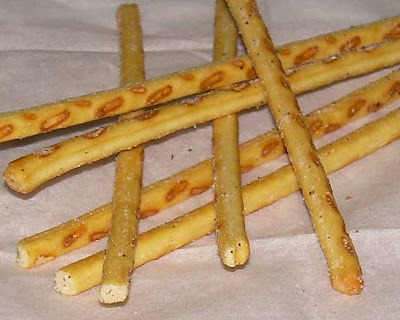 Pretz are just pretzel sticks presented plain or with flavoring. I'd say they were a savory rip-off of Pocky, but they're both made by the same company so it's not exactly theft. Also, this is a pretzel stick. It's a pretty basic concept that cannot be claimed as original to any particular company. This particular variety of Pretz has 6% cheddar cheese in it and I'm going to say that that's not nearly enough. When you open one of the two foil packets in the box, you smell a fairly strong cheesy flavor, but the smell doesn't translate into much cheese taste. They're also not incredibly salty. All in all, they're not a bad pretzel experience, but not a spectacular one. The back of the box makes mention of the fact that there is pepper on them, but there is very little and it doesn't make much of a difference in taste. There is also Sucralose in these. In fact, there seems to be a lot of artificial sweetener in Japanese snacks for reasons I can't understand. Japanese-made pretzels are no different than Western-made ones. They just cost a little more, are lighter in color, come in smaller portions and have less salt. Each box comes with two 31-gram (1 oz.) foil packets that will set you back 139 calories. If you're hot for some pretzels, these will do you fine, but don't expect any serious cheesy goodness to come along with them. I guess if you're getting potted and blowing off steam about the boss, you're probably not all that concerned about how much serious cheddar flavor you're going to get on your nosh. Lawson's runs a chain of convenience stores all over Japan. The curious thing about Lawson's is that the brand originated in Ohio, but it has grown to be the second largest convenience store chain in Japan. Lawson's presently has three different types of stores. One is your average somewhat expensive shop full of junk food and lunch fodder (bento, rice balls, etc.). Another is called "Natural Lawson's" and supposedly carries somewhat healthier fare including fruit and vegetables and health food products. The last one is a 100 yen store. The 100 yen shops carry a "Value Line." These are products which are large for their low price tag. I should note that none of these Lawson shops are located in my neighborhood, but I found this Swiss cake roll at a different 100 yen store. I guess that Lawson's markets their products to other shops or my local 100 yen place, called QQ, could be owned by Lawson's. 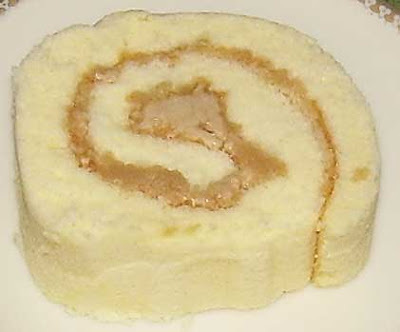 The Value Line Swiss cake roll has been around for awhile in vanilla, strawberry and mocha flavor, but a few new varieties have been introduced with the change in season. Since I can't resist chestnut (called "marron" here), I decided to give this cake a try. If you give the cake a sniff, it smells sweet, cakey, and ever so slightly like chestnuts. The cake itself is a nice, soft yellow sponge. It's not especially moist, but it's also not especially dry. It's a bit sweet, but doesn't carry much flavor on its own. I wouldn't be surprised if this was by design to allow the cream's flavor to dominate. The cream is very light and smooth. It has the texture of whipped cream and is sweet and has a somewhat subtle chestnut flavor. The cream also has a hint of coffee flavor and malt, but I believe that comes from caramel coloring and flavoring. The ratio of cream to cake is just about perfect. For 100 yen, this is a very nice Swiss cake roll. It isn't as good as a designer cake from a high quality patisserie, but it does beat more expensive cakes I've had from markets and bakeries. Generally speaking, the Japanese don't do cakes very well compared to some other Western born treats. One of the reasons for this is that they don't like their treats as sweet on the whole and sugar adds moisture so reducing the sugar results in cakes that tend to be on the dry side. However, this combination works well. You wouldn't be embarrassed to serve this to guests in a pinch and it certainly would make for an economical dessert if you're hankering for a bit of cake. The only problem with this cheap treat is that it's quite high in calories. The package says there are 382 calories in 100 grams and the entire cake weighs a little over 200 grams. I believe 5 servings would be fairly reasonable, but that's still a relatively small portion and weighs in at 152 calories. I'm guessing most people could put away 1/3 of the whole cake without batting an eye if they were looking to go a bit overboard. I've tried the vanilla variety of this cake before and it's good as well. I try not to have it very often, but it is hard to resist when it's so cheap and easy to find. The only hesitation I have about recommending it is related to the nutritional issues and not the taste. The Western view of most Japanese people is that they're sitting around daintily eating rice balls, sushi, and miso soup while sipping green tea. Those slim physiques are attributed to healthy eating so people expect shops to contain fresh, high quality food. By and large, markets are well-stocked with the kind of stuff that keeps Japanese folks so trim. However, the dairy aisle, conveniently located across from the beer aisle in my local market, offers a refrigerated contradiction to the image of healthy-eating Japanese. It's a calm, cool ocean of processed cheese and margarine spreads dotted with the occasional bit of massively overpriced real butter and cheese. Lining the top of the case is of the Japanese equivalent of "Kraft singles" are quite a lot of single serving "cheese" snacks. Up until now, I've been afraid to try any of them except the string cheese. 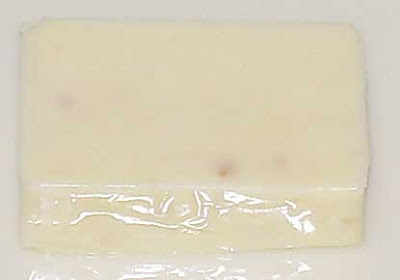 The string cheese has the advantage of being a rare natural cheese product. One of the scariest snacks I used to see was called "cheese candy" which had little bits of pale processed cheese wrapped like hard candies. I haven't seen those as of late, but I might take one for the Japanese snack review team and give it a try if it's still around. 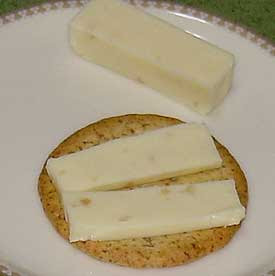 QBB has several varieties of snack-sized cheese. Each pack contains 4 individual little foil-wrapped blocks in an easy to open package. I could choose between "cream cheese", "Camembert", and "iron fortified plain cheese" in addition to the almond variety that I tried. Incidentally, QBB stands for "quality's best & beauty." The brand is produced by a margarine and butter company called "Rokko Butter Co." which was established in 1948. Besides processed cheese, they also make dried fruit and nuts. Most notably, at least in my opinion, they are responsible for distributing Lindt chocolate in Japan. Somehow it seems ironic that the same company that sells some of the very best consumer chocolate (in my opinion) sells so much processed cheese. Each little block of cheese is 18 grams (.6 oz) in size and is rather pale and has very small fragments of almond embedded in it. The blocks are smooth, shiny and firm, but yield easily to a butter knife. If it's closer to room temperature, it is softer, just like real cheese. However, I somehow doubt it actually would melt, but I didn't attempt to heat it as I'm afraid of the processed blob monster with teeth of slivered almonds that might result. I'm pretty sure this cheese is not meant to be used in that fashion. Each block is just supposed to noshed on, probably with a beer. There are 62 calories, 3.65 grams of fat, and 191 mg. of sodium in each 18 gram serving. For the quantity of cheese (72 grams/2.5 oz. ), it's not high priced for a cheese product in Tokyo at 128 yen ($1.30 USD), but it's also not incredibly economical. I decided to try the cheese both alone and on a cracker. With a pessimistic attitude, I gave it a try and it was actually pretty good. 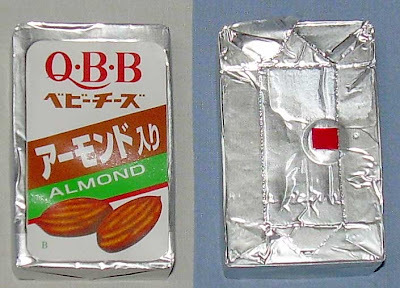 It smells very vaguely of almonds and when you bite into it, you get a solid hint of nuttiness as well as a cheesy tang. The sense of the almonds gets stronger as you chew. The texture is pleasant, but clearly not like natural cheese. It's softer and more uniform than most cheese. It's not unpleasant in any way, but there is a little bit of what I'd call a processed cheese aftertaste. I tried it on a Morinaga thin wheat cracker with wheat germ. This is a very hearty cracker, but the cheese flavor was able to compete with the earthy grains of the cracker. The ingredients list shows that the first ingredient is actually natural cheese and the second is almonds. Given how few almonds there are in it, this means the other ingredients are not present in great quantity. The third ingredient is whey. Many people don't know this but the way in which many types of processed cheese is made is by infusing the whey back into the cheese. Whey is a nutritious byproduct of cheese-making.The dreaded Velveeta is made by adding whey back into the cheese. In other words, this really isn't that bad for you. It's just more processed than natural cheese. I didn't expect to like this because it was processed cheese and my knee-jerk reaction is to believe that is bad, but I didn't find this too bad at all. If I were looking for something a bit more substantial and less junky than sweets or salted snacks, this would definitely be a contender. I won't be picking it up frequently, but I could see revisiting it when I was in the mood for cheese and nuts. I once had a conversation with a student of mine where I mentioned to her that the Japanese snack makers didn't seem to have much success with their varieties since they kept changing their products and trying out new variants rather than finding flavors the consumers enjoyed and continued to purchase. She responded by saying that, when she last went to the U.S., she felt sorry for Americans because they were always offered the same old things and didn't get a chance to sample as many varieties. The perspective each of us held summed up pretty well the difference between the Japanese consumer view and the American one. The Americans generally look for something great to add to their regular rotation of consumption. The Japanese are looking for something novel to try before they move along to the next interesting thing. Enter Pepsi White. A lot of people who have sampled this drink and blogged about it have wondered why it exists at all. They figure Pepsi is trying too hard or trying to be too wacky. What Pepsi is doing is building brand name recognition and interest in their drinks through offering short-lived varieties. The consumer is not supposed to love Pepsi White (nor were they supposed to be great fans of the previously released Pepsi Cucumber). They are only supposed to be curious enough about it to buy it until the limited distribution of it peters out. Keeping this as well as the bad reviews of Pepsi White in mind, I decided to give it a try. It's rather difficult to find since I couldn't locate it at any supermarkets. I could only get it at a 7-11 (which I rarely patronize). This fits in with the idea that the drink is for novelty. They expect people who are perusing a convenience store for a snack or drink to be more open-minded than the housewife looking to buy ingredients for tonight's menu. The convenience store price for a 500 ml. beverage is about 150 yen ($1.60 USD) so this was an expensive experiment. The packaging for the bottle looks pretty nice with the white label and little Pepsi logos. The ingredients list reveals that it contains fructose syrup, flavoring, citric acid, preservatives, and caffeine. No calorie information is offered, but I'm guessing it's the same as standard sugared soft drinks. A sniff reveals strong hints of lemon with a weaker hint of yogurt. 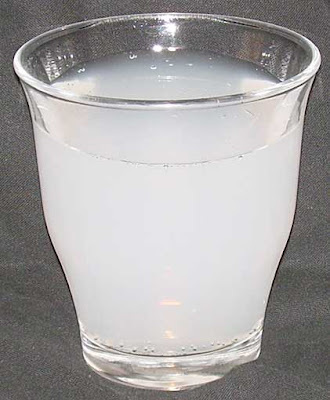 The lemon element is likely from the recipe for original Pepsi as regular Pepsi contains lemon. The first sip offers the taste of Pepsi with a yogurt-tasting finish. The flavor is actually multi-layered at first, though after a few sips, it seems to come together into a funky combination followed by more of a taste of Pepsi with a odd yogurt aftertaste. This is definitely a peculiar drink, but it is exactly what it sells itself to be. That is, it's yogurt Pepsi. The question isn't whether or not Pepsi successfully merged the flavors together, but rather whether or not they should have. As a curiosity being marketed in a country where yogurt drinks are very popular, there is some sense in offering Pepsi White. As a drink a person is supposed to drink and enjoy, it doesn't work at all. Still, it'd be interesting to see if the sales of regular Pepsi were favorably impacted by the release of strange novelty flavors like this. The Japanese don't celebrate Halloween, but they have all the trappings of wanting to do so. Scary television programs are scheduled in line with the holiday. Some shops sell decorations and many of them sell candy as if kids were going to be going door to door begging for sugary niblets. The bag of mini KitKats pictured above has all the earmarks of being the sort of candy you'd buy and pass out when kids in costumes ring your doorbell. However, no kids are going to go out and mooch for candy in Tokyo on October 31. It simply isn't the sort of thing the Japanese would do. The bag design for these Kitkats has ghosts, witches hats, stars, bats, and a pumpkin on it and is in traditional Halloween orange. The individually wrapped small bars inside also have a similar theme. When you open the bag, you smell artificial caramel immediately. This was a bad sign in my opinion. If the sealed packets can't contain the smell, how strong must it be? After opening a packet, I was heartened to see that they are covered in milk chocolate rather than white chocolate. That means that the coating probably is just regular milk chocolate and not infused with the artificial caramel purin flavor. Despite the intense smell, the bars themselves have a good balance of smokey caramel purin flavor and chocolate. Purin, by the way, is really just custard with a burnt caramel sauce on top of it (like flan or créme caramel). This bars taste exactly like one of those custards covered in milk chocolate and the taste is quite enjoyable. I'm guessing they succeeded because the flavoring is kept in the cream between the wafers where it belongs rather than mixed in with the chocolate. One side note about the mini bars is that they seem to melt quickly when you hold them. I'm not sure why the melting point of these should be so low, but I'd recommend refrigerating them. Room temperature bars will melt on your fingers and make a mess. There are about 14 or so little individually wrapped bars in one bag. The packets all have different messages on them. One of them said, 'Halloween is the time when children's dreams come true.' I'm guessing a lot of Japanese kids dream of not learning thousands of Chinese characters or cramming for brutal rounds of entrance tests more than candy, but I'm thinking such dreams are unlikely to be fulfilled. I don't believe you can buy this flavor in a "single serving" bar size, but it could simply be that they are not sold in that form in my area. 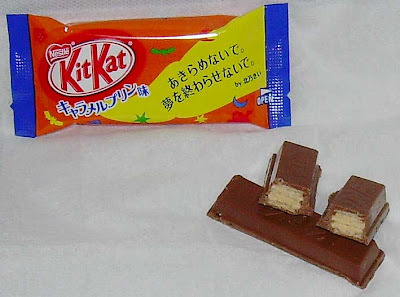 Each bar is about half the length and about the same width as a conventional Japanese KitKat bar. There are 66 calories in one mini bar. If you'd like just a little something sweet, they're just the right size. While I wouldn't rate these higher than a classic KitKat, they are definitely one of the better flavored variations that I've encountered lately. If you want a change of pace, or want something you can share around the office, these would be a good choice. 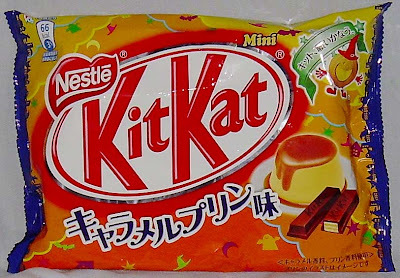 badmoodguy in paradise: Nihonjin Nibbles: Halloween KitKat and Jen's KitKat Blog. My husband and I have received this particular brand of cookie twice as souvenir gifts from Japanese folks. The first time, we received a large box of them and this time a somewhat smaller packet. 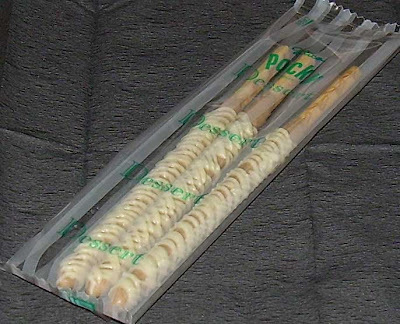 In both cases, the cookies were wrapped inside of their larger packaging in two-packs. We did our best to savor these wonderful cookies and make them last awhile. They are little white sweet blocks of cookie heaven. There are a wide variety of confectioners who make these types of biscuits. These ones were made by Nanpudo and can be ordered on their site, though they are generally purchased as a souvenir from Okinawa (as they are a specialty of that area). 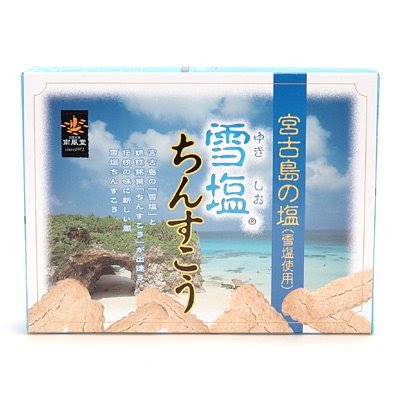 Several of the makers of chinsukou have ships as part of their logo or the cookie packaging. This is a common icon because the word chinsukou is related to the Yangtze River in China. It's not exactly clear, but there is a relationship between sinking snow and salt and the Yangtze which have something to do with the story behind these cookies. Fortunately, the cookies taste nothing of snow, salt or the Yangtze river. These cookies is that they are a good example of how some similar food concepts develop independently of one another. These are mainly made of lard, flour, and sugar and are very much like a shortbread cookie you might buy in the U.K. 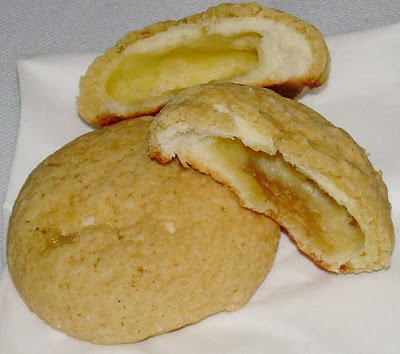 These are a bit more sugary than conventional shortbread and this particular variety also has a wonderful vanilla flavor which is pronounced but not overwhelming. In fact, the taste is likened to vanilla ice cream by the marketers who sell these cookies. When you sniff the cookies, they smell like fresh Christmas sugar cookies. The smell is very familiar and not at all foreign to those of us who grew up outside of Japan. They are dense, but crumbly. They have coarse bits of sugar in them which add to both the texture and taste. They start off mildly sweet and floury and get a bit sweeter (in a good way) as you nibble away. As I've mentioned before when writing about snacks sold mainly as souvenirs, there is no calorie information, but I'm guessing these are very evil on that front given the main ingredients. That being said, the cookies are very small and the two-packs encourage portion control. If you're in Okinawa and are looking for a souvenir to take back home, by all means buy these. I can't imagine anyone would find these anything but a delight unless they had some crazy aversion to nutritionally suspect food. Pick yourself up a box (or two) to have with tea or coffee as well if you have the self-control not to eat yourself sick. They are just that good. If you're not familiar with Mont Blanc, it is a dessert made of pureed chestnuts and whipped cream. You can find many permutations of it in most Japanese convenience stores, markets and patisseries. The original dessert is Italian and is named after a mountain in the alps. Mont blanc (the dessert, not the Pocky) has a pile of chestnut with whipped cream on top and vaguely resembles a snow-topped mountain in appearance. Mont blanc is one of my favorite desserts so I was very pleased to see this version of Pocky in the stores. In fact, as fall arrives, many chestnut and mont blanc sweets start to appear on the shelves of Japanese stores. It's just one more reason to be happy that summer is over, as if the stifling heat and humidity ending and the cockroaches packing up and leaving Tokyo weren't good enough reasons. The popularity of chestnut sweets at this time of year is linked to the habit of consuming chestnuts in Japan at this time of year less so than to mont blanc desserts, popular as they may be. Like the previously reviewed orange dessert Pocky, the Mont Blanc Pocky is sweeter and has a thicker coating than regular Pocky. They are also a little more expensive and each individual packet contains fewer sticks. Run-of-the-mill Pocky gives you 5 sticks with a puny coating. 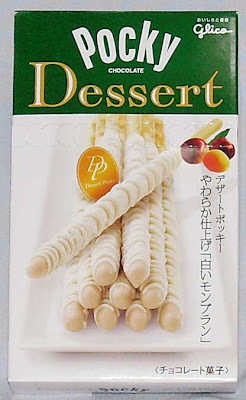 Dessert Pocky offers 3 decadently coated sticks. When you open the packet and give it a sniff, it smells pleasantly of chestnuts. 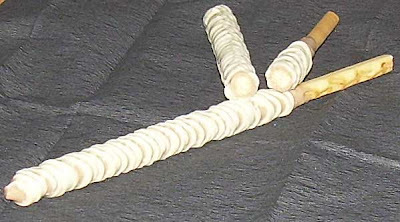 The sticks mimic the appearance of the dessert by having a brown "chestnut" colored coating and a white drizzle representing the whipped cream. The coating is sweet, but carries good chestnut notes, particularly at the end of chewing. I've complained about too sweet desserts before, but it isn't the sweetness that I object to so much as the fact that it's difficult to detect any other flavor behind all that sweetness. The chestnut dessert Pocky does a great job of keeping the flavor despite being pretty sweet without being overwhelming or artificial tasting. This is a balancing act Glico, the company which makes Pocky, did well with on the orange dessert Pocky as well. Unsurprisingly, the ingredients are very similar to the orange dessert Pocky, including artificial sweeteners to keep the calories down. Three very satisfying sticks only set you back 97 calories. If you like chestnut and are in the mood for something with a hint of decadence, these are really a splendid option. If I allowed myself to buy another box, I think they also might be interesting to try after a quick dip in hot coffee. Back when I was working in a Japanese office, my (Australian) boss used to buy 2 liter bottles of tea called "ju-roku cha". "Ju-roku" in Japanese is 16 and "cha" is tea. I'm not sure why 16 is the magic number for these types of tea blends, but I fondly remembered working with him when I saw this bottle of tea. Incidentally, "hato" means "dove" in Japanese. I don't know if this is supposed to be "dove tea" or if the name carries some other meaning, but there's no reason for doves to be connected to the contents of the bottle. Well, let's just say I hope doves are in no way a part of it. When my boss was drinking this tea, he offered me a taste, but I turned him down because it smelled very "earthy" to me. In fact, I jokingly used to call it his "dirt tea." The brand he drank was bottled by Coca-Cola Japan. The brand I decided to buy is clearly a direct knock-off and is made by TopValu. TopValu specializes in making cheap versions of popular items. Most notably, they make a KitKat copy for about 28 yen (27 cents) less than the real deal. This 500 ml bottle of 16 Hato Tea Blend was 78 yen (77 cents). A similarly-sized bottle of the brand name ju-roku cha would be at least 100 yen ($1). The tea is a blend of many other teas including barley (Hato barley), 2 kinds of green tea, and oolong. It includes brown rice, persimmon leaf, ecommia bark, jiagolan, wolfberry (all three Chinese herbs used in traditional medicine), shiitake mushroom, orange peel, vitamin C, kelp and "herb tea". It's quite the potpourri of earthy elements. It's no wonder I called it "dirt tea". When I opened this bottle, I mostly smelled the mugi-cha (barley tea) and oolong elements. This sort of tea is marketed mainly at the health and beauty market and it is so for good reason. It tastes as good as the mixture of ingredients sound like they might taste together, which is to say not particularly good. The tea is unsweetened (the whole bottle has only 6 calories) and no effort has been made to really do much about the flavor. While you drink it, it's not so bad, but once you stop and your tongue has a moment to process what has just passed its way, it is a little bitter and tastes like you stirred a glass of oolong and barley tea with a dirty mushroom. In fact, I think the tagline for this tea should be something like, "mushrooms you can drink!" Honestly, I think it tastes like water that has been wrung out of an old, dirty sock. If you're really interested in Chinese medicine or are willing to adapt your palette to a new flavor (or are a serious fan of mushrooms), this may be for you. If you love mugi cha, you may find this more appealing. Personally, I couldn't finish the bottle though I really did try. After choking down half of it, I had to throw in the towel. There are a great many things that the Japanese have taken and adapted to suit their tastes which have presented an equally good, but unique, take on a Western favorite or improved upon it. One of the things which has been a disaster by and large has been cheese. Japan's markets are full of packets of processed cheese and most of the Japanese people I've known don't cook with actual cheese. It's essentially a cheese wasteland of Velveeta-philes, though there is no actual Velveeta in Japan, curiously enough. Given the tastes in Japan toward cheese run more toward the processed end of the cheese spectrum than the matured cheddar end, any cheese-flavored product has to be approached with trepidation. That said, hope springs eternal so I picked up this back of "three cheese" chips. If you look at the outside of the bag, it shows little glossy bits of melted cheese on the outside of the chips. While these dabs of cheese look plastic-like and hard, they are actually very soft. If you run your finger across one, it rubs off easily. It's more like a wet paste that is flung over the chips than melted cheese. The real chips, as opposed to the illustrated ones on the bag, have very few of the cheese globs on them. They are also lightly coated with an orange powder. The chips smell like chips with the vaguest hint of cheesiness. They are decently crispy and have a vague cheese flavor which resembles, unsurprisingly, processed cheese. Think "Kraft Singles" and you have a good idea of the flavor. If you are careful and put the side of the chip with cheese blobs and powder directly on your tongue, you get a stronger cheese taste. Also, the chips near the bottom of the bag are cheesier than those near the top. The ones at the top are serviceable, but are more plain-tasting chips. The front of the bag claims that there is Cheddar, Emmantal (Swiss), and Gouda cheese on the chips. The truth is on the back where it lists the ingredient as "cheese powder" derived from these three cheeses. There are also some sweeteners (e.g., Stevia) and the usual gang of chemicals in flavored chips. The overall taste of the chips is artificial. It's more about chemistry conveying a hint of cheesy tang, than actual cheese flavor. They aren't bad, but they aren't great. They're certainly not worth the 450 calories you'll consume if you put away the whole bag. 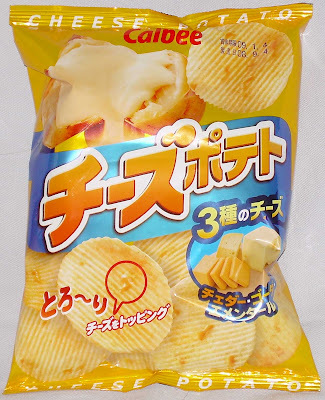 Calbee is one of the best chip makers in Japan and I'd go for one of their bags of "salt" (plain) chips over these if I were in the market for a salted snack accompaniment to a sandwich. The packaging on a lot of Japanese sweets is pretty clear cut and designed to give you a good idea of what is inside. Most of it is also modern-looking. Morinaga, which has been in business since 1899, has quite a few products with rather old-fashioned packaging. One of my former students was married to a man who worked at Morinaga and she told me that the company was deeply steeped in old-style thinking and culture and reluctant to change their ways. If you look at the box for these caramels, you can see a lot of their old-fashioned design on them. The same goes for their plain chocolate bars which come in a plain brown wrapper with an ornate frame design around the name of the company. The company's old-style logo (an angel holding an "M" can be seen in a square at the top of the box). There is a more modern-looking logo on other products, but its line of caramels, retains the old-fashioned design. This is probably because caramels were the first confection the company made and can be considered a signature product. They may also not appeal to young folks so much as nostalgic older people. I've noticed that the caramels are much harder to find than other Morinaga sweets. 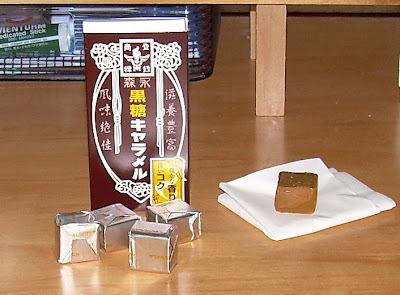 At the moment, there are three types of these caramels on the market: the original milk caramel, black sugar and adzuki. I've never seen the red adzuki flavor box in any store, and I can only locate the black sugar ones in one of the 4 markets in my immediate area. "Black sugar" is what Western folks call "brown sugar", though it seems more heavily influenced by molasses than the "brown sugar" you buy in bags (to cook with) in Japanese markets. In fact, brown sugar sold for baking and whatnot is very light and only a stone's throw from white sugar in taste. The black sugar sweets you can buy, on the other hand, are very richly flavored. These caramels are no exception. When you unwrap the foil, there's a smooth bit of caramel which is only the tiniest bit sticky to the touch so your fingers don't get messy. It smells sweet, milky and somewhat of honey. In fact, the American candy that it very much reminds me of is "Bit O' Honey." Though the blocks are firms, they quickly soften up once you put them in your mouth and start to chew. They're also rather nice to just allow to melt a bit by sucking on them like a piece of hard candy. While it is sticky like most caramel, it doesn't stick terribly to your teeth. I'm not sure how Morinaga manages this feat, but it's appreciated. The caramel is rich and floods your mouth with a sweet, buttery, brown sugary flavor. It's delicious. The ingredients include sugar water, brown sugar (60% grown in Hokkaido), milk with added sugar, sugar, vegetable oil, rice flour, salt, sorbitol, caramel coloring, and flavoring. As you might expect, you're essentially getting a whole lot of sugar in these. 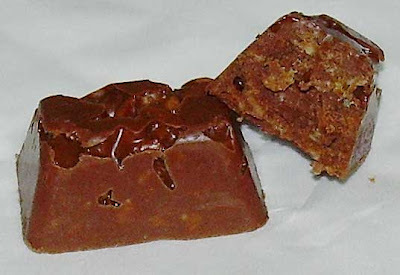 The size of the caramels is rather small which makes them much easier to chew as well as provides good portion control. There are 12 candies per box and a box costs about 130 yen ($1.24). The whole box is 245 calories so they weigh in at 20 calories apiece. Given that these are both traditional and tasty, they are a great item to sample if you have a chance. I'm guessing they'd also be the ideal thing to just toss in a bag and keep around for awhile for those times when you'd like a little sugary pick-me-up. One of the first things you notice when you enter a convenience store in Japan is that there are many different and highly interesting looking baked goods on display. It's a bit like the Hostess displays that you might see in American 7-11's or Sheetz. The main difference is that the Japanese ones are not nearly as sweet and have a much heavier overtone of bread rather than cake. Also, there is rarely a pie of any sort in sight. After you sample a few of these things, you find that a lot of them are pretty vile and bland white bread-based items. Many of the savory options are little more than hot dog buns with corn, mayonnaise, and small quantities of tuna, eggs, ham, or sausage. The sweet options sometimes provide a little more promise, but they also tend to be your basic white bread buns or rolls filled with various flavors of whipped cream, jellies or beans. I've got nothing against the fillings, but putting them on a hamburger or hotdog bun is just gross. Fujipan (the "pan" means bread) makes a variety of bread products in Japan with a heavy emphasis on sandwich bread, "stick" bread, and various snacks. They also market bread snacks based on the Japanese animation character "Anpanman". In various convenience stores, it's not uncommon to run across one or two of their current line of snacks in the baked goods area. At my local shop, two types of Fujipan melon pan were in stock. One was chocolate chip and looked suspiciously like it may actually have been melon- flavored. For the record, a lot of melon pan doesn't taste like melon. It only looks like it. Since I am not keen on the idea of chocolate flavor mixed with melon, I decided to give the maple flavor a go. A bag with 4 pieces cost 100 yen (about 95 cents USD) so they're fairly cheap. Each piece is more like a soft cookie than a bit of bread. Melon pan is actually made of both bread and a cookie topping. The inside of these cookies is like regular bread dough that has been spread with a maple-flavored fat spread (this is literally what it's called in the ingredients list) and then a cookie dough topping is poured on top of it. It is baked and the bread rises a bit, the filling is largely absorbed into the interior, and the cookie shell is supposed to get a bit hard. The inside is actually hollow and is coated with the residue of the maple fat spread. The main problem with buying melon pan in these sorts of plastic packages for mass distribution is that the cookie shell gets soft. Half of the pleasure of a melon pan is the crispy shell on top of the bread. You only get that half if you buy your melon pan at an actual bakery. That doesn't mean that the texture of these is not interesting or enjoyable. It just means that it is not an optimal melon pan experience. When you open the package, the melon pan smells of maple. They are soft, but not spongy. The texture is tender and they get a bit doughy as you chew them. The maple flavor is not overwhelming or overly artificial. I'm pretty satisfied with the flavor balance, but I think many Western folks might like them to be sweeter. Whether or not you like this is going to hinge heavily on how you feel about the texture. The doughy quality and varied texture of the bread and cookie shell may or may not suit some people. I found these pleasant and think they'd make a nice occasional snack with tea or even a light breakfast with coffee. The only thing to keep in mind is that you don't want to eat too many at once as they are 110 calories apiece and almost certainly contain "bad fats". I'm guessing that the "maple fat spread" is probably made with margarine or some other fat mixture that includes trans fats, though it is impossible to know for sure since there's no explanation on the package. I might pick these up again some day, but I can't see putting them into any sort of regular rotation. Since they seem to be a seasonal item for autumn, there may not even be a choice in the matter. I think sampling these once or twice a year would be just about right. The bag is showing (and telling) you that you can put them on your finger. It doesn't tell you that this isn't really a good idea unless you like powdery stuff all over your fingers. The three most popular flavors of salted snack food in Japan are seaweed, "salt", and consomme. Of those three, the only one which has a powerful flavor is seaweed. I'm not sure how or why consomme came to be such a big flavor, but it is essentially a chicken (or, on rarer occasions, beef) flavoring dusted on the snack food. Consomme is the happy medium for people who find the plain flavors too boring and the seaweed too gross. It's saltier and carries a meaty flavor (referred to as "umami" by the Japanese and food snobs around the world who think "savory" and "meaty" aren't good enough terms for them). I actually tried two varieties of "potato ring snack" by Tohato in small bags which I could pick up for about 45 cents (50 yen) each. 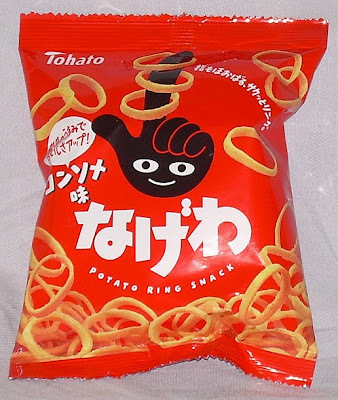 Tohato, incidentally, is the purveyor of many salted snack foods in ring form including some fairly hot and spicy habanero rings. The company has been around since the early 50's and it's raisin cookies ("All Raisin") are staples in most Japanese markets and convenience stores. I used to eat the All Raisin cookies regularly when I first arrived in Japan because I thought they were relatively healthy. Then, I learned how to read some Japanese and realized otherwise. The company's name relates to the word for "dove" in Japanese ("hato") and the company was involved in some sort of golf course related funny business in the first part of this century. Their slogan is "a good heart", though I imagine consumption of their products leads to anything but. The plain variety of these is called "Poteko" (ポテコ) was bland and unremarkable. They weren't salty enough and simply were like eating crunchy nothingness. The consomme flavor was heavily dusted with salty meat and vegetable flavored powder. Imagine crushing up a consomme soup cube and sprinkling it all over a salty potato ring thing. They even smell like powdered (chicken? beef?) soup. The first bite carries a heavy hit of the flavoring. It seems almost chemical. As is often the case with these things, subsequent bites are less intense as your tongue becomes less sensitive to the flavors. You also start to pick up on some sweetness mixed in with the salt. A look at the ingredients reveals the presence of the artificial sweetener Sucralose. If you couldn't work out the fact that these are a processed snack by the fact that they are rings, the fact that potato granules and flakes are ingredients would give you a clue. There's also a whole lot of powdered flavoring in it including onion and tomato powder, and beef extract. These are relatively tasty and you get a lot of rings (29 grams/1 oz.) in the bag for 157 calories. However, if you're looking at weight rather than the number of rings, these are pretty bad for you even compared to a similar bag of chips. A 1-ounce bag of Lay's potato chips is 130 calories and has 10 grams of fat so you pay a bit more in calories for these rings and they are rather inferior to Lay's chips. The ring style of them makes you feel like you're eating a lot more though than you feel you're getting in a small bag of chips, so you do get the psychological benefit of feeling like you're stuffing yourself with salty goodness. These are pleasant and I might pick a bag up again if I was in the mood for something savory and nothing else looked especially good. I'd avoid the plain version at all costs unless I was in the mood for crispy cardboard rings, but these are not bad at all. One of the local convenience stores near my home is a 99 yen (about $1) store. While many of the items are 99 yen, some are actually cheaper. 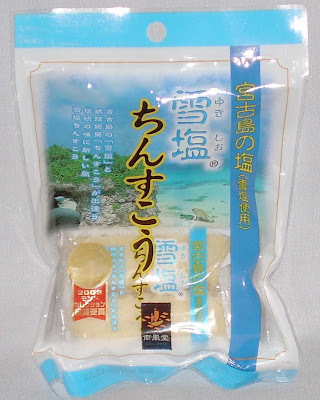 There is a selection of small bags of salted snacks which are 4 bags for 99 yen or about a quarter/25 yen apiece. I'm not sure if these small bags are there for portion control or if they are directed toward children, but they are stocked near a variety of sweets that are definitely directed toward kids. In the past, I've purchased "Christmas Packs" directed toward kids which contain a variety of snack items including salted snacks and sweets. One point I noticed about them was that they tended to contain "junk food" which was a bit less junky than those items marketed toward adults. This bag of Super Heart Chiple seems to fit the same mold. The chips are not made with potatoes. They are made with non-glutinous rice and resemble extremely light sembei both in texture and flavor. 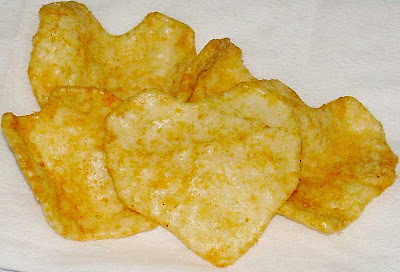 Each chip is super light, heart-shaped and has little bumps on it as if it were cooked on a patterned baking sheet. While fat is the second ingredient, I don't believe these were deep fried. They are not overly oily, but they are shiny and (very marginally) greasy-feeling on the outside. The red dust on the outside is paprika. When you open the bag, you get a whiff of garlic. The front of the package shows a garlic bulb and says that they've improved the garlic flavor. The chips are savory and lightly salty. Despite the flames around the garlic bulb, they are not actually hot though you can experience a cumulative hot garlic effect. The spiciness level is really quite pleasant and well-balanced. They do leave a pretty garlicky aftertaste in your mouth though so you don't want to eat them if you're in a position to offend someone else with your breath. The company that makes these, Riska, is not a well-known brand. They appear to specialize in these sorts of cheap snacks and I wasn't surprised to see that they produce a lot of the bags of snacks in the section which offers 4 for 99 yen at the local store. They also seem to be responsible for a variety of children's sweets. The company is relatively young by Japanese standards, having been started in 1971. Like many companies, they have a quaint "philosophy" meant to humanize public perception of them rather than view them as merely a business. The company's production concept is "heart mind". The idea is that the "mind" part is related to technological advances and the "heart" relates to keeping the quality and touch of hand-made products. The entire bag of chips is 15 grams (1/2 ounce) which doesn't sound like much, but there is a lot of crispy enjoyment in it. It's light because the chips are puffy. I didn't count, but I think there may be 20-25 chips in the small bag and it's only 84 calories. The main thing about these which may not be attractive to some foreign palates is that they do taste like sembei (rice crackers). If you like sembei and garlic, you will very likely enjoy these and they will offer you something salty which isn't as bad for you as a bag of chips. I certainly will be revisiting these next time I want something salty and crispy. 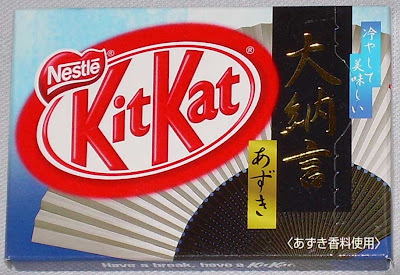 KitKats that are flavored with traditional Japanese tastes should hold the promise of an interesting and unique experience. 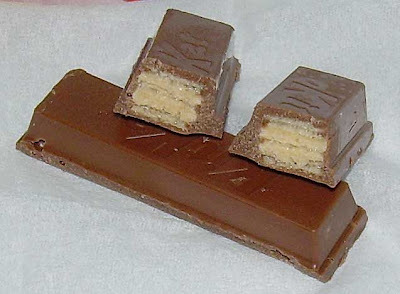 The KitKat Adzuki flavor box encourages this idea. It tells you that this "can be used as a Japanese snack" and it has a fan design and fancy Japanese writing. The packaging is whacking you over the head with the very Japanese-ness of this flavor. With the aforementioned notion in mind, I picked up the adzuki (or azuki, depending on whose spelling you take as valid) variety at the local 99 yen shop. 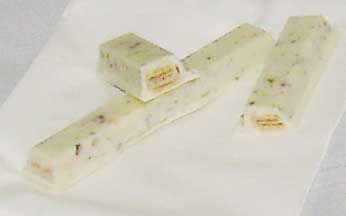 Upon opening the bar, I was immediately disappointed to see that it was a white chocolate bar studded with little brown spots. The reason this is disappointing is that the beans being sprinkled throughout the white chocolate means that the flavor is almost certainly going to be buried deep in sweet white chocolate. I gave the bar a few good sniffs and strained my nostrils to detect any whiff of beany goodness (if nostrils can be strained). Remember receiving white chocolate rabbits in your Easter basket when you were a kid? Yeah, you remember because they were the ones your mother bought to add an aesthetically pleasing look to the basket by mixing the rabbit colors. You were disappointed to see the white ones. This bar smells like those rabbits, like bland white chocolate. It smells like disappointment. My first bite revealed a massively sweet flavor with only the barest bit of adzuki flavor at the tail end. I was hoping that once my tongue recovered from the initial sugar shock that I'd be able to taste more of the adzuki. It's also sometimes the case that you can get the effect of layering a subtle flavor through continued consumption. Sometimes your tongue becomes more attuned to such flavors as you eat more. In this case, I found that I actually tasted less adzuki as I continued to eat. My tongue grew immune to what few notes of bean there were. Two fingers and 114 calories later, I remained disappointed and my throat was burning from the sweetness. A look at the ingredients reveals that adzuki is pretty far down the line after several types of sugar. American candy is often cited for being too incredibly sweet, but the truth is that Japanese candy can be just as bad, or worse, than some American candy. This adzuki bar certainly proves that. There has been a dairy shortage in Japan for quite some time now. This mainly manifests itself in a butter shortage. You can't buy butter just any time but rather must wait for those special days with blocks of sweet fatty yellow pleasure happen to show up on the shelf. Another way in which the dairy shortage has been showing an effect is in the ice cream case. You see a lot more ice milk (アイスミルク), which is often called "rakuto aisu" (ラクトアイス) in Japanese and scant quantities of the real deal with all of its full, creamy badness. The majority of dairy products have increased in price across the board, so finding anything which is both real ice cream and cheap is a rare find. The Morinaga vanilla ice cream sandwich is one such rare delicacy. It is a full-size ice cream bar (119 ml./4 fluid ounces) filled with real ice cream that is peppered with actual vanilla beans. The wrapper says that the ice cream contains 20% more vanilla bean flavoring than the previous incarnation and 10% full fat milk products and 10% low fat milk products. This bar cost about 100 yen (95 cents USD) before the dairy shortage and continues to be sold at the same price. When you open the package, you smell the biscuit. It smells pretty much like a cookie with no particular flavoring. The generous portion of ice cream is flecked with tiny black vanilla beans and the first bite reveals strong, natural vanilla flavor. The ice cream is creamy and sweet. This is what good vanilla ice cream should be and the type of thing that would win over a chocolate lover who thinks vanilla is just too boring. It's that good. The biscuit portion doesn't have much flavor, but that's okay as it is merely a convenient holder for the yummy ice cream The cookie is soft, but not fragile. It has a very good texture for eating a slightly melted bar. It's easy to bite into, but doesn't crumble or fall apart. However, I have purchased these bars on occasion and found they have a crisper cookie. I believe that they are likely designed to soften with a little time as they absorb moisture and fresher bars have firmer biscuits. The entire bar is 235 calories and contains no exotic ingredients. It's hardly healthy, but it's a very nice treat once in awhile. If you run across one of these amongst a variety of cheap bars at a convenience store, this is the one to choose. You're unlikely to get better quality at a such a low price. As a kid, I don't recall ever eating a gummy bear or any of the other popular forms of gummy. In fact, the only gummy I recall were fish that could be bought as penny candy back when such a thing existed. To be fair about my age, I'm not that old. Penny candy died out before I was 10 years old and it was never really good penny candy. You could get one gummy fish for a penny or a really tiny lame gumball, but you couldn't get a Reese's miniature for anything less than a nickel. Because I never craved gummy (or gummi, if you like) and I value my teeth too much to eat a lot of sugary candy, I rarely try such things, but the idea of something fruity caught my fancy today at the store and I found this little 46 gram (1.6 oz) bag of sweets. These candies are made by Kanro which has the tagline, "a fairytale in your mouth." I'm not sure if that's supposed to be enchanting or scary. I guess it depends on which fairytale it is. If it's the three little pigs, I'm guessing we're talking mouthwatering pork products. If it's Snow White, it could be dwarven ale (good) or poison apples (bad). I shudder to think what I'd be tasting if it's Rumpelstiltskin. Kanro makes a lot of candy made from sugar syrup rather than sweets like cookies, cakes, or chocolates. It's also a relatively small company compared to some of the bigger guns in the Japanese confectionery business. They make hard candies and throat lozenges as well as these gummies. In fact, I've been a regular consumer of one of their herbal sugar-free lozenges during most of my stay in Japan. These lozenges are quite effective, though they still seem to have the power to make my teeth ache despite being sugar-free. These Puré brand candies appear to be the only brand of gummy they make and come in four flavors, blueberry, pink grapefruit, lemon and grape. 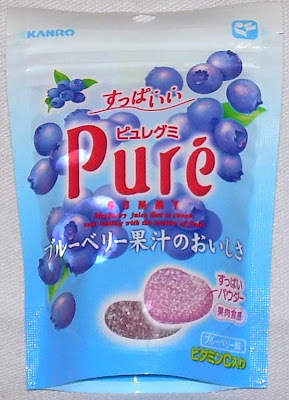 The English on the bag says of Puré blueberry gummy says "blueberry juice that is sweet-sour tasting with the texture of fruit." This statement is half true. 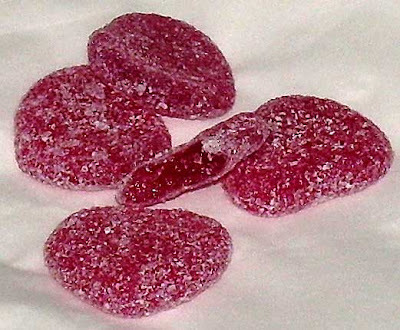 These candies are sweet and sour, but the only way they have the texture of fruit is if you're talking about something which resembles thick fruit leather. These gummi feel soft when you squeze them with your finger, but are tough to bite into. It's very hard to bite one in half and then you have to chew on it for a bit to warm it up so it softens. By the time that happens, it's all nearly dissolved in your mouth. The candies are covered in citric acid powder, but it looks like good old coarse bits of sugar. In fact, one reason I bought these is that they resembled Sunkist fruit gems. Trust me when I say the similarities are all superficial. These are nothing like a fruit gem either in taste or in texture. When you give the bag a sniff, it smells sour and not overly fruity or perfumey. It doesn't smell much like blueberries, but it does smell a bit like some sort of fruit. Each candy is vaguely heart-shaped. When you first bite into it, you're hit full on with the sour notes, but that gives way to an increasingly sweet taste and finally a pleasantly perfume-like berry taste. The experience is very nicely multi-layered and vastly different from my experience with generally sweet American "blueberry" candy. It's as if the candy changes as you masticate it. This keeps it from being too sweet or too sour. The ingredients for this are relatively predictable. They include sugar, water, gelatin, concentrated blueberry juice, and pectin. Vitamin C and Calcium are also added in to enhance nutritional value. Each candy is 12.3 calories and has 2.88 mg of Vitamin C. Though you hardly would scarf down the whole small bag at one go, you could easily snack your way through one throughout a day if you kept them in your desk drawer. I didn't expect to like these much, but I really did enjoy them. They are much closer to the experience of eating a real blueberry taste-wise than I expected. While I'm still not a fan of the rather tough texture, I'll probably buy these again some time when I'm in the mood for a fruit-flavored candy and feeling reckless about my teeth. I recommend giving them a try if your run across them. Two of my students recently returned from a holiday in France. They gave me a small box of salty butter cookies as a souvenir. The one who gave it to me said that salty sweets are currently "a la mode" (in the style). This is true not only in France, but in the U.S. and Japan as well. Salty caramels are particularly hot right now in America. In Japan, one of the most popular salty sweets is called "potechi". It is crushed potato chips covered in chocolate and can be bought at department stores. They are somewhat expensive, but very good. 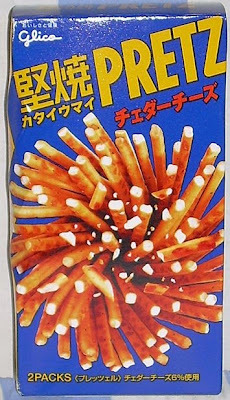 When I saw a box of chocolate-covered potato sticks at the local 99 yen shop (like a dollar store in the U.S.), I figured that the salty sweet trend had gone mainstream. I picked up the box and decided to give it a try. After all, the front of the box says something like 'sweet and salty, you can't wait!' Who am I to argue with their assessment of my patience to try their product? The box makes a point of letting you know that the potatoes used in the sticks have been grown in Hokkaido. In Japan, Hokkaido is like the Idaho of potatoes and mentioning the regions of origin of various ingredients is a common selling point. I'm not sure how much of the quality of the potato matters when they've been cut into slivers, deep fried, and covered in chocolate, but I'm guessing that isn't really the important point when marketing a food item. There are 8 chocolates in the box. Each is individually wrapped in gold foil with "Tasty Crunch" and "Hokkaido Choco Potato" written across it. When freed from their gilded packages, they smell of sweet chocolate. The chocolate is milk, but has a stronger, deeper smell than some milk chocolate. 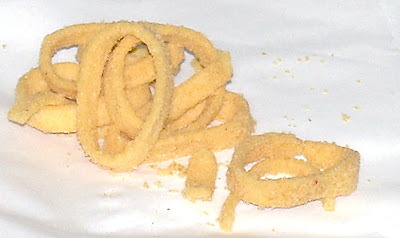 The more expensive version of this type of chocolate (Potechi) is made by dropping crushed chips into a circular mold and filling it to a high point with chocolate. In the pricier department store variety, you can see an even base of chocolate around the bottom where the ample quantity of chocolate has pooled. In these cheap ones, they've clearly opted to use less chocolate. There is an incomplete "base" around them and a few spots where pockets of air were in the molds. When you bite into these, they have a very nice crunch and a decent chocolate taste, but something is a bit off. The potatoes seem to carry a strange taste which gets more pronounced as you chew. At first, I thought they were perhaps recycling potato sticks past their due date in these and that's why they tasted funny. When I looked at the ingredients, I realized that the odd flavor was from "cheese powder" that had been added to them. 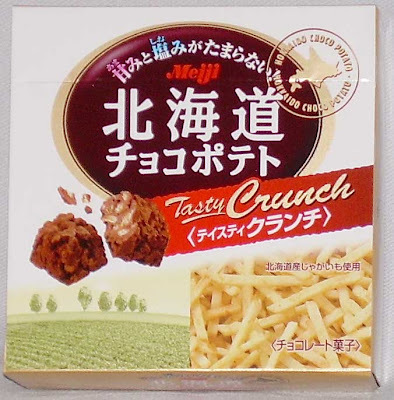 I have no idea what compelled Meiji to add cheese powder to a chocolate/chip combination, but it ruins the flavor. If it weren't for the weird cheese taste being thrown in there, I think these might be quite good, but it's hard to say for certain. These are worse for you nutritionally due to the fried potato aspect and pack more calories than your average treat at 45 calories per small block. I wouldn't buy these again and I'm very likely to simply throw away the rest of them. The box promises "tasty crunch", and they are crunchy, but not so tasty. I like hot (as in spicy) food so these chips appeal to me more so than the average bland, plain chip. 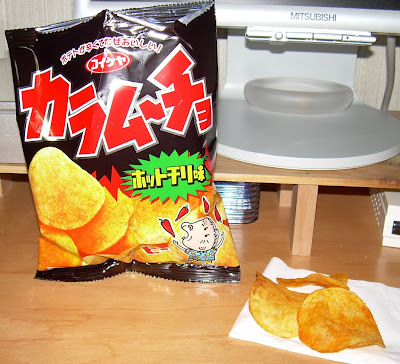 They're also the only regularly-available hot chip in Japan and one of the first types I tried so many years ago when I first arrived. That being said, I have only eaten them about 4 times in 19 years. I decided to revisit them and see what it was that kept me from going back more often. I wondered if a big part of it wasn't that they were bad, but rather that they were too different from American chili and barbecue chips. These chips smell mostly like regular chips despite having a visible dusting of red powder. 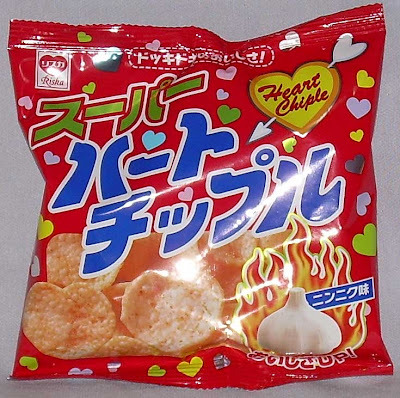 On first taste, you are hit by paprika, garlic and onion flavors. The quite mild heat of the chili hits a second wave. The blend of flavors seems designed to make sure the actual potato taste isn't buried in the spices. These aren't exceptionally salty chips and I think that's why they don't produce as strong a burn. That being said, there is a very slow heat build up and by the third chip, I was feeling an irritation in my throat and a few extremely vague and short-lived little burn spots on my lips from the spice. 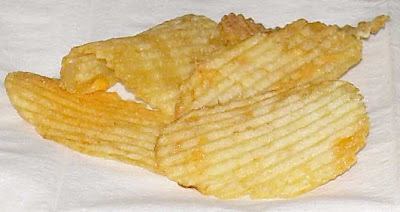 The chips are mostly medium size and most of them do not have dark spots on them. There is a lot of air in the bag and almost no smashed chips at all. They are nicely crunchy, not overtly greasy, and of average thinness. 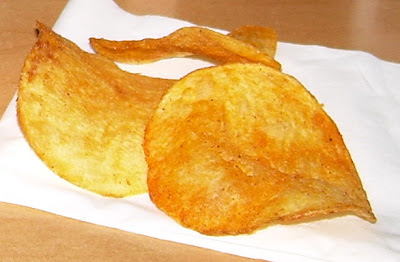 Personally, I prefer chips that are cut in this way rather than those which are extra thin or thick cut. I bought this small bag(28 grams or just under 1 oz.) in a 99 yen shop where a variety of salted snack foods in small packages were being sold at a price of 2 for 99 yen (94 cents so 47 cents for this one small bag). The entire bag will cost you 154 calories, 9.5 grams of fat, and 168 mg of sodium. If you like things that are just a bit spicy but not painfully hot, these are really quite nice. Personally, I prefer quite a bit more of a burn factor from my spicy chips, but I believe these pack a much nicer flavor profile. Really hot chips are mainly giving you the neurotransmitter rush as your brain deals with the "pain" from the burning. These actually taste good and have a well-balanced mixture of chili and other spices.